EDUCATED MINDS. FIT BODIES. ACTIVE COMMUNITIES. What does BALANCE have to do with increasing MUSCLE SIZE? Many of us have heard the saying, “we must crawl before we walk and walk before we run.” A key word missing from this old adage is “balance.” To rephrase, we must balance our body while crawling and do the same for sitting, standing, walking, hopping, running, and any other movement or static hold exercise. BONUS KNOWLEDGE: Learn more about how and why flamingos stand on one leg. Click image. A: Balance and stability exercises help improve body stabilization, align imbalanced muscles, and increase joint strength. And with a stabilized body, balanced muscles, and increased joint strength, your body is in an ideal position to gain muscle size. Oftentimes, we get caught up doing common exercises that involve weight machines, free weights, and group fitness classes. But the reality is that these exercises become more effective when anchored by a solid balance training program. What exactly do I mean by balance training program? Dynamic balance is the “ability to move and change directions under various conditions without falling,” (Clark, Sutton, & Lucett, 2014, p. 246). Balance training develops “synergy and synchronicity of muscle firing patterns required for dynamic balance and neuromuscular efficiency,” (Clark, Sutton, & Lucett, 2014, p. 248). In other words, balance training helps our muscles move more efficiently. Thus, dynamic balance is interconnected to hypertrophy (i.e., increased muscle size) and other neuromuscular skills (e.g., speed, flexibility, endurance). The National Academy of Sports Medicine’s (NASM) integrated performance paradigm states that force reduction and stabilization are required for force production. In other words, the ability to successfully execute dynamic balance exercises (i.e., balance training) helps us increase force production for strength exercises. Increases in strength helps us achieve hypertrophy or an increase in muscle size. Balance training also helps correct kinetic chain imbalances; thus, improve muscle imbalances and flawed movement patterns. As a result, joint stress is relieved, neuromuscular efficiency is improved, and we are less susceptible to injury. With increased neuromuscular efficiency, we are able to maximize prime movers in strength building exercises and in turn, increase the size of muscle fibers. Enough with the talk about balance training. Let’s chat about a couple of BALANCE TRAINING EXERCISES. 1. Multi-planar lunge to balance: Stand with feet shoulders width apart and pointed straight ahead. Place hands on hips. Begin with a basic single leg forward lunge. Keep toes pointed forward and knees aligned with toes. Push off the front foot and maintain balance on the back leg. Repeat. Switch legs. Repeat. You can progress this exercise in different planes of motion (frontal plane, or lateral lunge; transverse plane, or turn 90 degrees). You can also add weight (e.g., weighted vest, dumbbells) to make this exercise slightly more difficult. I found a video that demonstrates this exercise. 2. Single leg Romanian dead lift: Stand with feet shoulders width apart and slightly raise one leg (the knee of the raised leg should be slightly bent). Place hands on hips, bend from the waist down and reach the hand opposite of planted foot down to touch toe. Planted leg will slightly bend. 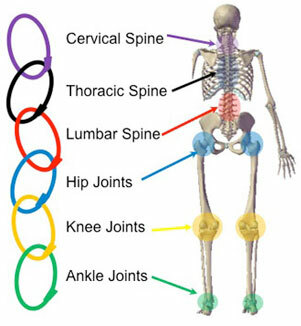 Keep spine in neutral position and try not to hunch over and round the back. Slowly come back up to starting position. Repeat. Note: if you can’t reach your toe, you can regress this exercise by reaching down to touch your shin or knee. You can make this exercise more difficult by standing on an unstable surface (i.e., balance beam, half foam roll, balance disc) and eventually adding weight (i.e., dumbbell). For both exercises, play around with the duration of the isometric movement or the point in which you return to the starting position. For example, lunge forward for 1 second, hold the lunge for 1 second, return back to single leg balance and hold for 3 seconds. You can also play with the tempo of the concentric (acceleration or movement against the direction of resistance) and eccentric (deceleration or movement in the same direction of the resistance) movements. Have fun with it! Feel free to ask me about other ways to progress (increase difficulty) or regress (decrease difficulty) these exercises. Clark, M.A., Sutton, B.G., & Lucett, S.C. (Eds.) (2014). NASM essentials of personal fitness training. 4th ed. Burlington, MA: Jones & Bartlett Learning. Enter your email address to follow our blog and receive notifications of new CEbFit blog posts by email.